The Scrovegni Chapel was built to atone for the wages of greed but ended up becoming home to one of the great works of Western art. The chapel was built in 1305 by wealthy Italian banker Enrico Scrovegni. The young Scrovegni’s father had been a notorious userer, or purveyor of bad loans, charging so much interest as to crush those that owed him money. At the time this practice was considered so vile as to end someone’s soul in hell. Scrovegni’s father was so well-known for his illegal interest that he is even name-checked in Dante’s Divine Comedy as one of the souls in the Seventh Circle of Hell. The Scrovegni Chapel was built as a measure to atone for his father’s sins, and while the building itself is architecturally unremarkable, Scrovegni was able to retain the services of one of the most renowned artists of the time to decorate the interior. The fresco cycles adorning the interior surface of the Scrovegni Chapel, or “Cappella degli Scrovegni” in the original Italian, are unanimously viewed as the most important work of famous Italian artist Giotto di Bondone. Here his painting style achieved a deeper maturity and concepts like depth, volume, and space reached a more complex and organic level of realization, all of which would pave the way for the Renaissance artists. A total of 38 scenes are arranged on three overlapping bands upon the side walls portraying the lives of Mary and Jesus. With keen attention to detail, highly dramatic representations of the characters and organic construction of the spaces, Giotto created a dynamic storytelling pattern, culminating in the big “universal judgement” fresco, which covers the entire surface of the wall beyond the triumphal arch. 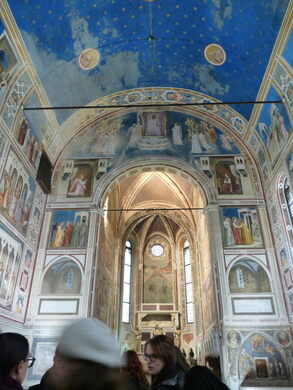 Giotto also added fake architectural elements to the plain interior space of the chapel. Where mouldings and pilasters are absent, the visionary artist provided painted, highly decorated versions of them. Using the “trompe l’oeil” effect, the artist was able to create the illusion of the “real space” of the chapel defined by his painted architecture and the “painted” space inside the scenes. Whether or not the Scrovegni Chapel was able to make up for the sins of the father is unknown, but Giotto’s contributions to the history of art at the site are indisputable.